A new DA has been submitted by Calile Malouf Investments to transform what is arguably one of James Street’s most prominent sites. 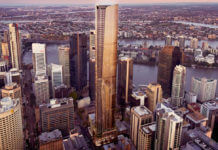 46 James Street, also known as the ‘Centro building’ which houses retail stores like Sass & Bide is planned to undergo a significant retail and hotel redevelopment. 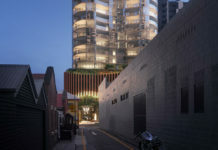 The project plans to inject more retail and hotel facilities while enhancing streetscape integration by removing the current underdeveloped surface carpark which fronts directly onto James Street. 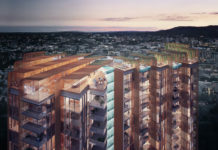 Designed by Richards and Spence, the James Street Hotel Project has a GFA of around 10,715m2 and incorporates a mix of retail, restaurants, boutique hotel and associated car parking and service amenities. The hotel tower comprising 142 rooms reaches a height of seven storeys (including the amenities housed in a mezzanine below level 1). 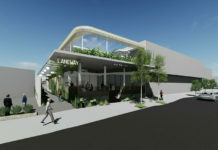 Ground level retail is planned to remain vibrant and active to all four building facades, while glazed shopfronts are to be framed by double storey brick arches, providing a unique architectural style for the growing boutique shopping strip. 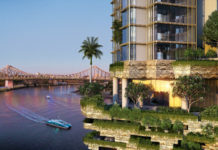 The development has been designed with Brisbane’s sub-tropical climate in mind, by utilising external spaces for recreation purposes. Hotel amenities include a pool, day spa, bar/restaurant, garden, roof terrace, function and meeting rooms. There are nine planned retail tenancies on ground level totalling 1,728sqm. The DA number for this development is (A003833376). Great for an already booming area!  Great for us locals too except having to tolerate the building processes for how long? Maybe 5 years given the remainder of the block is destined for development too. As long as we don’t lost Tom Gun Shoes, Sass and Bide and Ultratune. These are very special places to do business and they are much appreciated.